It looks like Deciem is in big trouble this time. 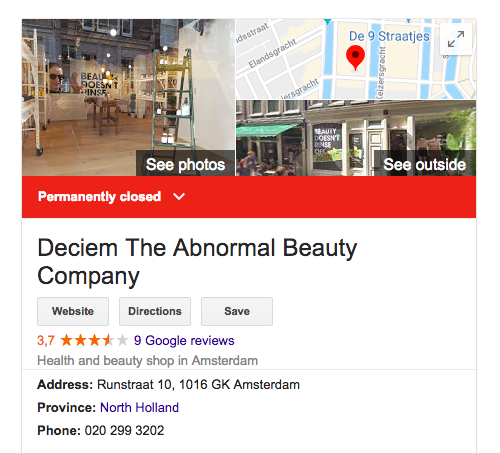 After the crazy Instagram-video posted yesterday by Brandon Truaxe, Deciem closed ALL European stores including the one recently opened in Amsterdam and the U.K. On Google maps it even says that the Amsterdam-store is “permanently closed”. Yesterday BestAnti-Aging.com was the first blog to cover the story on the crazy Instagram-video Truaxe posted. The man behind the populair cult brand The Ordinary hasn’t lost it, like many speculated on social, but is in deep trouble. Cosmopolitan is making up #fakenews to earn money on you! So what the hell is going on with Deciem?! Today we tried to call almost all stores in Europe and we didn’t get an answer. We finally spoke an insider and she told us that “The financial department has found a big financial fraud in European stores”. She didn’t want to tell exactly what this fraud is, but confirmed that all orders placed on Deciem.com, The ordinary and Niod are being fulfilled with delay. We love Deciem, but would advice to wait with ordering till there is more confirmed news. UPDATE Oct 9, 3:32pm: Deciem has shut down all stores worldwide. UPDATE Oct 9, 5:55pm: Deciem website is down and Ulta has responded to us that Deciem will NOT be available on Ulta in 2019 anymore.